There is no greater refuge than family. Family members are on the front lines of care. In times of need, family is who we turn to first, and usually, they are the people who remain with us throughout. Our desire and willingness to provide care for the people we know and love, however, doesn’t mean family care isn’t complicated. Here are three common reasons why providing and receiving family care can be complicated even though caring for and receiving care from someone we love is something many of us would never forego. Family caring for family is seemingly natural. Expected. It’s what love is all about. It’s what we do for people we love. Rarely, if ever, do we explicitly state these responsibilities, rather we internalize them and they become the very reason for our care. We love, therefore, we care, but that doesn’t mean we don’t experience frustrations and challenges typical of all relationships. All relationships involve expectations, and familial care means that we oftentimes care without the expectation (or hope) of reciprocity. As we accommodate our life to care for an ill family member, the burdens of care can become more pronounced—financial stressors, time demands, changed living arrangements, and work-care conflicts. Because we are family, we care despite these stressors. Over time, however, it is difficult not to experience frustration, burnout, and exhaustion simply because we must re-imagine our relationship with our ill loved one without the expected relational markers that once defined our relationship–shared hobbies, fellow traveler, confidant, cheerleader, admirer, financial provider, early-morning walker, lover, late-night television watcher, conversationalist…. In the midst of the unending needs of care, we must simultaneously rethink our relationship in ways that defy our past experiences without the explicit relational benefits we once received. We know the person we care for and they know us. We grew up with them. They were our mothers or fathers or siblings. Relational intimacy is an overwhelming motive for care. A shared family history can also complicate care. The very person we care for may feel trapped by not feeling comfortable sharing what is happening to their bodies, dreams, and anxieties because of how such disclosures might affect us. What if your mother told you of her desire to stop treatment for her illness? Of course, you’d appreciate her honest disclosure, but at the same time, would you be able to unlearn that knowledge amidst the backdrop of daily car rides to chemotherapy treatment? The people we care for are vulnerable. They need us. They love us. But can they always authentically and openly share frustrations with us, their primary lifeline to the world? Can they always realistically disclose doubt or helplessness or disappointment in light of everything we are providing them? Similarly, can we always authentically and openly share our frustrations with our vulnerable loved ones? Can we always realistically disclose our doubt or helplessness or disappointment when we know they depend on us for almost everything? Frustration and disappointment are inevitable experiences of relationships, but these experiences may be even more pronounced for family caregivers and loved ones needing care. The irony is that because we know each other so well, some topics and conversations and feelings will remain silenced because of our desire to maintain our relationships with those we care about most. Someone who has first-hand experience with a particular illness. Someone who shares a similar diagnosis. Someone who will not flinch or become embarrassed by what is happening to their body. Someone who will not make judgments about them and their condition. Someone who will not hold them hostage to their past. Someone who will not hold them hostage to their loved one’s hopes for the future. Caregiving is something we do out of love. And it is our very love for the people we care for that can sometimes make family care deeply moving, but also complicated. We are thinking of you and your wife. 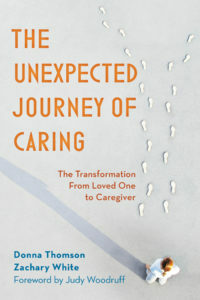 We hope you find some solace in the Unprepared Caregiver community.